A story of Fear..... of not finding forever after and questioning your heart. Naina has always been a strong headed, lively and carefree person. She always felt that there was a reason for everything. She believed in love, commitment and sacrifice, but when her three year old relationship crumble down in front of her she lost all the hope in love and marriage forever. With time and help of her friend, Naina starts afresh in a new city with a new job and people around. For the first time in her life she was not looking for love but a deep urge to stand on her own feet made its way in her life. Little did Naina know her life was going to change? Nothing could prepare her for the storm of love in the shape of Nihal, the confident, persistent and handsome guy she met at her boss housewarming party. Read on to know, will Nihal be able to penetrate the cold walls covered around Naina's heart or her insecurities are more than enough to lead them on different paths in life. 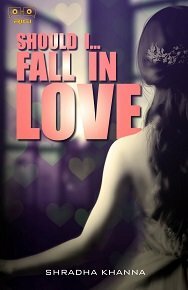 A story where thinking that questioning your heart with "Should I", can stop you from "Falling In Love". Review- Should I.... Fall In Love is a simple, realistic love story of emotional yet strong Naina and Nihal. Shradha has done amazing work with her debut book by keeping it simple and realistic. Kudos to the author for her amazing debut. Book Cover and Title- Book Cover is intriguing and attracts readers. Title is appropriate with the content and gives us hint about the content. Blurb is interesting and further discloses about the story. Language and Narration- Language of the book is simple and easy to comprehend. Writing style of Shradha is lucid and binds readers with the book. Few quotes in the book are worth noting. There are few editing errors in the book which should be improved in next edition of the book. Characterization- The two main characters of book are Naina and Nihal. Naina is a workaholic who uses work to be busy and ignore her painful past. She is happy with her life but deep inside misses 'Love' whereas Nihal is dashing, flirtatious guy who meets Naina during work. The way Shradha has sketched her characters is beautiful. Characters are realistic to most, thus story connects with the readers. Theme- Theme of the book is Friendship, Love and self realisation while fighting with self insecurity. Storyline and Plot- Though plot is not so unique and predictable at most of the times, the perfectly woven sub-plots and connecting characters binds readers with the book. Story is fast paced where scenes are happening quickly which makes book reading an interesting experience. Note- I received this book from Kalamos Literary Services in exchange for an unbiased and honest review.